Don't forget to include a Notarized copy of your DD-214 or other pre-arranged document(s). I. DESCRIPTION: An oxidized silver badge 3/4 inch in height and 2 1/2 inches in width, consisting of a shield with its field scored with horizontal lines and bearing the coat of arms of the United States on and over a pair of displayed wings. A star is added above the shield to indicate the degree of senior aircraft crew member and the star is surrounded with a laurel wreath to indicate the degree of master aircraft crew member. II. SYMBOLISM: The badge is the same design as that for Army aviator with the coat of arms of the United States substituted for the shield of the coat of arms of the United States. The wings suggest flight and reflect the skills associated with aerial flight. The coat of arms of the United States on the shield signifies loyalty and devotion to duty. 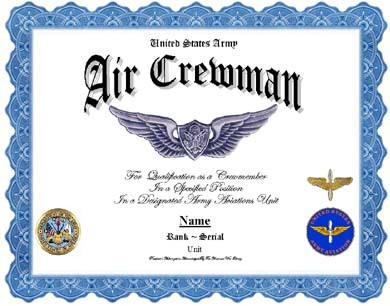 Crew Member: Individual must be on flying status as a crewmember in a specified position or non-crewmember in the case of observers, medical aidmen, gunners, aircraft maintenance supervisors or technical inspectors. Senior: Be recommended and on flying status as a crewmember or as a non-crewmember, performed 7 years in one of the principal duty assignments above, and attained grade E-4 or higher. Master: Be recommended and on flying status in a specified position or non-crewmember position, have performed 15 years in one or more of the principal duty assignments above and attained the grade of E-6 or higher. Personnel who have met the above requirements at any time since 1 January 1947 are eligible for these badges. IV. DATE APPROVED: Approved by the Deputy Chief of Staff for Military Operations on 16 May 1962. V. SUBDUED BADGES: Subdued badges are authorized in metal and cloth. The metal badge is black. 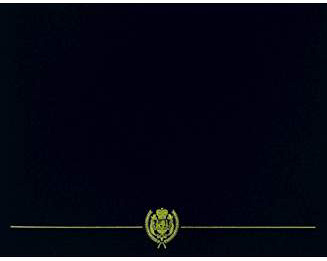 The cloth badge is of olive green base cloth with design elements embroidered in black. Aircraft Crew Member - 21/64 inch high and 1 1/4 inches wide. Senior Aircraft Crew Member - 13/32 inch high and 1 1/4 inches wide. Master Aircraft Crewman - 15/32 inch high and 1 1/4 inches wide. Miniature badges for the three degrees are authorized in the following sizes: 19/32 inch high and 2 inches wide; 11/16 inch high and 2 inches wide; and 23/32 inch high and 2 inches wide, respectively.